रुपरेखा: Jesus delivered a man controlled by evil spirits. Jesus came to free us from the power of Satan. Jesus has defeated Satan. Stay away from the ways of Satan. Ask Jesus to help you. He will never leave you. Listen brothers, I want to tell you a true story. I am going to tell you about one time when Jesus delivered a man from evil spirits and showed His power over them. There were evil spirits in Jesus' day just as there are evil spirits today. Jesus and His followers went by a small boat to the country of the Gadarenes. (Make sure the description of the boat is correct. It was a boat big enough for 8-13 people.) As soon as Jesus got out of the boat a man with an evil spirit saw Him. This man did not live in a house, but in the place where they bury the dead people. He didn't wear any clothes, and he was very wild. The people were frightened to go near him. 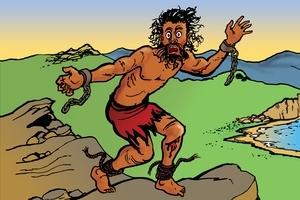 Some men had tried to control this man by putting chains around his arms and feet, but he would break them apart. No man could control him. All the time, day and night, he would make terrible cries as he cut and beat himself with stones. This man was truly ruled by Satan's evil spirits. When the possessed man saw Jesus from afar, he ran and knelt down before Him. Just as Jesus was to cast out the spirits from this man, a spirit inside the man shouted out very strongly, "What do you want to do with me, Jesus Son of the Most High God? Swear to God that you won't torture me!" Jesus asked the spirit, "What is your name?" It answered, "Other people call me `Many' because we are many." Jesus said to him, "Come out of the man, you evil spirit." [SOUND EFFECT: SCREAMING OF THE EVIL SPIRIT AS IT LEAVES THE MAN, FADES AWAY.] And the spirits went out from the man. They entered into a large herd of pigs. The pigs ran into a lake and were drowned. After this the man in whom the evil spirits had lived received a right mind. He dressed himself and hurried to the boat where Jesus was preparing to leave. This man begged Jesus saying, "Please sir, let me go with you." But Jesus did not permit this. He said, "Friend, you return to your people and tell them how much the Lord has done for you. Tell them how He has had mercy on you." The man returned to where he lived. All over his area he told the people what Jesus had done for him. The people were greatly amazed. Now, I have told you how Jesus delivered a man who was controlled by evil spirits. In our area, too, there are many evil spirits. Satan is like a poisonous snake on the trail who waits to harm you. Jesus came to this world to destroy the works of Satan. Although there are many evil spirits in the land, Jesus is not frightened of them. Jesus is very, very powerful. He came to free us from the power of Satan. The evil spirits know who Jesus is and are frightened of Him. They know that Jesus will punish them severely. Stay away from the ways of Satan and evil spirits, witchdoctors, superstition and sorcery (Make this fit local practices). Ask Jesus to help you. Jesus has defeated Satan and all his works. He has power to deliver you from Satan. He will make you His son and daughter. He will never leave you if you trust in Him. GRN has recorded a version of this script in 312 languages and dialects. See full list.